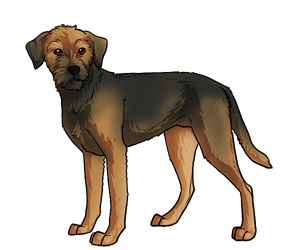 Possibly the oldest breed of terrier in Great Britain, the Border Terrier originated in the Cheviot Hills near the Border of England and Scotland. The breed was developed not as a pet, but purely as a hunting dog to keep the foxes at bay. The breed was developed to be fast enough to keep up with a horse, but low enough to the ground to follow fox underground. Border Terriers in the 18th century were often not fed in hopes that it would keep the dog's hunting instinct up. The Border Terrier was recognized by the AKC in 1930 and now serves mostly as a companion dog to many families. Border Terriers own more AKC earthdog titles than any other breed of terrier. Because of their immense prey drive, the Border Terrier has been known to hunt and kill animals or devour their small toys. The Border Terrier ranked 8th in number of registries by the UK Kennel club in 2008.